Newly relocated to the Sierra Nevada Foothills, Table Nectar is a small family owned and operated catering and event production business, born from a passion for preparing food that both nourishes the body and excites the senses. We are committed to supporting local and sustainable agriculture, farmers, and businesses and through this, we give back to our community, support our local economy, and honor our planet and her precious resources. Established in 2007 Table Nectar started in the Bay Area with a dream do what we both are passionate about a desire to pour our hearts into something we could really stand behind. Table Nectar took shape slowly and organically and after 6 years of working diligently, we decided to relocate to Kim’s hometown to start our family. 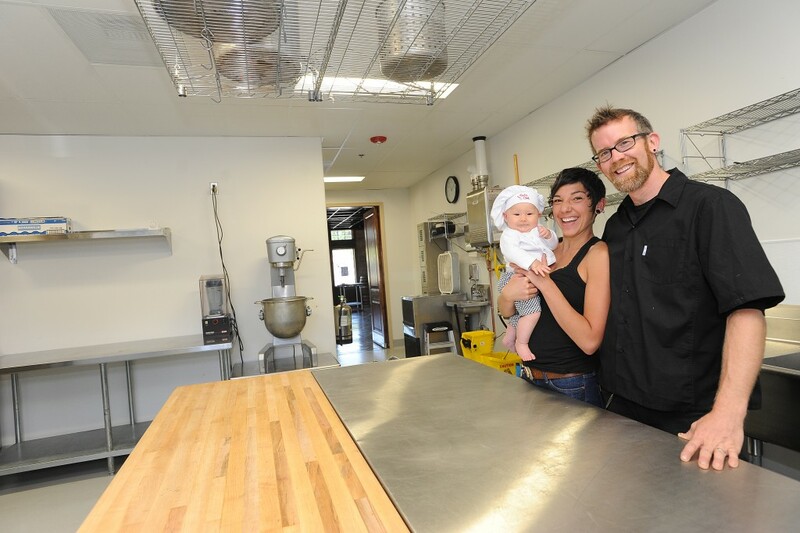 After the birth of our daughter in January of 2013, we are finally opening our doors here in El Dorado County and have big plans to take our business far beyond just catering. To us, “local and organic” is not a fad, style, or diet, but a way of life and conducting business. We provide our services out of a real necessity to scale back and drastically reduce our dependence on food sourced from faceless agribusiness giants in distant locations and re-introduce ourselves to the countless delights of locally produced seasonal food grown and produced as nature intended. When you hire Table Nectar, you’ll enjoy an artfully composed, hand-made meal with the comfort, familiarity, and flavor that only the Foothills has to offer! We are committed to using fresh, minimally processed, locally sourced, organic, pesticide-free, and/or non-GMO ingredients in our kitchen at all times. The only exception to this is by specific request of a client when the natural/organic/non-GMO item is simply not available to us. We NEVER use canola, safflower, corn, sunflower, soybean, peanut, vegetable, shortening, margarine, or any hydrogenated oils in our kitchen. These cheap and heavily processed fats are often rancid and can be toxic to the body. In recent studies, they have even been linked to reproductive problems, hormonal issues, obesity, mental decline, cancer & heart disease. Oh yeah….and they often come from genetically modified sources. In our kitchen, we cook with minimally processed oils that have been used for thousands of years in traditional diets from around the world. They are olive oil, coconut oil, butter, ghee, hemp seed oil, avocado oil, sesame oil, lard, and tallow. We believe these oils are healthier for our bodies, have less impact on the environment, and are easier to digest. We only offer a few fried items on our menus. On the occasion that we fry, we use Non-GMO certified rice bran oil grown and processed in California. Even though it is processed, we like to use this oil because of it’s extremely high smoke point (490F). We make all of our salad dressings in-house using real Virgin Olive Oil. while most restaurants and catering companies use canola oil or a product called “Pomace Olive Oil”. If you want to destroy the health benefits of a salad, use Pomace Oil in your dressing. It is a hugely inferior product made by extracting the residue left after producing virgin olive oil from the pomace (the solid remains of the skins, pulp, stems, and seeds) using chemical solvents and extremely high heat. The remaining product, used ubiquitously, in eating establishments across the US, is often high in cancer-causing chemical contaminants and extremely low in beneficial oleic acid. Yuk! We cook and/or finish preparing your food fresh on-site whenever possible because we want your meal to be flavorful and vibrant rather than soggy and dull. Many catering companies fully cook your food at their kitchen, transport it hot, and serve it with little or no set-up or on-site cooking. This means, when you hire us to cater your special event, your labor costs will be slightly higher than with most of our competitors because it takes a few additional bodies and a little bit longer to set up a kitchen at your event and finish cooking your meal just before service! Fresh is best! Nobody in our company is paid minimum wage. We strive to pay everybody that works on our team a livable working wage. You can taste the love. No really….we believe that eating is a very intimate act and we take preparing something that you put into your body very seriously. We love and care about what we do and all that good energy goes directly into the food we make. To put it simply, if we are angry or stressed or having a bad day, we step out of the kitchen until we can change our attitude. Food is art and our culinary team consists of artists. Why? Because you eat first with your eyes and your meal should look as good as it tastes! When we cater your special event you can expect us to go above and beyond. We will not only work with you to accommodate your special dietary restrictions and customize your menu to your unique preferences, but we will beautifully present your meal right down to the very last detail! No matter how big or how small the event, we consider YOU our guests! We understand warm hospitality and want you and your guests to feel comfortable and taken care of without having to worry or lift a finger. We are detail oriented and staff the events we cater with a team of friendly, hospitable, approachable, and diverse service and kitchen staff so that we can exceed your expectations in every way possible!